Would you be surprised if I tell you that it is absolutely possible to have a beautiful new smile in just one day? There are many patients who have spent a major part of their life looking for a way to get back their lost confidence. Many are told they are not implant candidates, or that they will need painful and costly bone grafting procedures prior to receiving implants. Now, thanks to advances in implant technology and new protocols developed by experienced oral surgeons and prosthodontists, you can replace failing or missing teeth in just one day. Current dental implant technology allows less invasive surgery without bone grafts that results in the ability to replace failing or missing teeth with customized, hand-crafted replacements immediately. Most patients can have the solution they’ve been seeking… teeth in a day and often without bone grafting! Call us today for a free consultation! 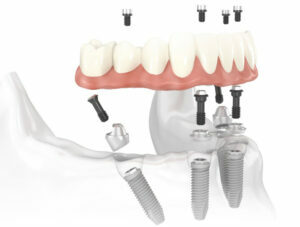 (415) 992-9188 | Or email us | Click here to learn about Dr. Rabinovich and dental implants via video. Free Consultation: In this free initial visit, patients meet with the oral surgeon who will conduct a clinical exam, and brief the patient on what to expect from the procedure itself. Day of Your Procedure: Patients arrive in the morning and, under the effects of a local anesthetic and oral or intravenous sedatives (if they so desire or need), any remaining failing teeth (if any) will be extracted and two titanium dental implant screws are placed in the front and back of the tooth row (four in total per jaw). After a short recovery period during which the customized dental prosthesis is fabricated, the patient will get their non-removable bridge attached to the implants. They will subsequently be free to return home and show off their “beautiful new teeth in one day” smiles! Post-operative: Over the next few months, the titanium implants will be biologically fusing with the bone of the jaw, a process termed “osseointegration”. Patients are advised to avoid eating hard and crunchy foods during this period. Post-operative pain and discomfort is minimal. The revolutionary ‘teeth in a day’ or ‘all on four’ is now considered the most convenient and effective solution for people who are seeking to replace all of their teeth or get rid of their dentures. If you are fed up with re-doing your bridgework over and over, are on the verge of losing your natural teeth, or you simply would like to say “good bye” to your dentures, this dental implant procedure is for you. This breakthrough procedure eliminates the standard healing time or the need for multiple procedures and allows a new, non-removable bridge to be placed on the very same day as your dental implants. Our San Francisco Dental Implant Office has the expertise, experience, and equipment necessary to support the “beautiful smile in a day” dental implant procedure. Most of our patients are qualified to arrive for surgery, have their implants placed, and their replacement teeth fitted in just one day. Of course there are a few dental and medical conditions that may make this difficult. Be assured, our oral surgeon will discuss your case thoroughly with you. We spend as much time as necessary to help you understand your medical and financial options.